If the last year of the '90s is special to Rajinikanth, marking as it does his completion of 25 years in the film industry, then I must say it is special to me as well. I too have a cause for celebration: Rajinikanth has done 25 films under my direction, which is more than any other director can claim. It is a matter of pride to me. These days much is being made of the hero who plays a 'negative' role. It is seen as a big career risk, and the actor is applauded for his courage in taking on such roles. The same goes for what they call 'performance oriented' roles or roles that go against the star's accepted public image. But it is nothing new really. When Rajini was doing action films and building a loyal fan base, I cast him in Bhuvana Oru Kelvi Kuri. The role demanded that he underplay his star image, cut out his mannerisms and play a 'soft' character. Shivakumar, then a romantic hero, was cast in a 'negative' role in that film. This was the first film the two of us did together. It proved a huge hit. What made the film work was the performances of all the lead stars. By then, Rajini had also played a few villain-ish roles -- you have to remember that his first few roles, in Moondru Mudichu and Avargal for example, had negative connotations. Then he began doing action roles. 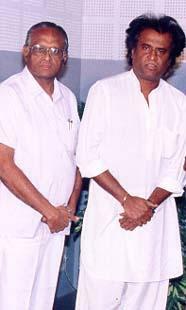 Once Panchu Arunachalam, who went on to produce a lot of the films that Rajini and I worked on together, and I had called Rajini over while casting for a film called Avalukku Oru Aasai. We were considering him for a small role. But after meeting him we found a certain incandescence, a 'brightness', about him. We decided we didn't need him to do that small role. We preferred to cast him in something bigger, better. Thus, when Bhuvana Oru Kelvikuri was conceptualised, we cast Rajinikanth in the role of the man who takes care of the heroine, Sumitra, after Shivakumar makes her pregnant and ditches her. If you remember the film, Rajini plays a 'soft' role. He lives with Sumitra as her protector in an entirely platonic relationship. We went on to do other films that had Rajini playing roles alien to the action image he had built for himself. Like Aarilirunthu Arupathu Varai and Engeyo Ketta Kural. In the former, which examines the life of a man from the age of six to 60, Rajini had to go through the gamut, from young to old. He did it with aplomb, without bothering about his image. Another milestone was Murrattu Kaalai, a film shot in a village setting. Jaishankar, who generally plays hero, turned villain, while Rajini, shedding the flamboyant clothes that were by then becoming his trademark, played the hero in a very folksy, village-style get-up. This was an entertainer out-and-out. The stunt sequences were a hallmark. There is one atop a moving train choreographed by Judo Rathnam that is still talked about when landmark stunts are described. 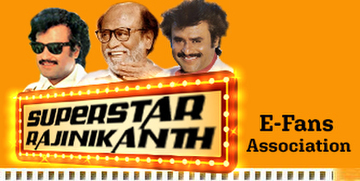 If Rajini was all involvement when doing the earlier performance oriented roles, he was equally involved in this film. He worked hard, participating in the stunt sequences without a double, striving for excellence. This was also the film where for the first time -- of course, now this has become a trend in all Rajini films - a song, 'Podhuvaga en manasu thangam, oru pottiyinu vanthuvitta singam', was written specifically with his image in mind. That film was the finishing touch to Rajinikanth the actor, star and now the superstar. From that point on, Rajini acquired a larger than life image that was difficult to break. However, it is a mark of the man that he then did Shri Raghavendra, a saintly role completely at variance to his usual flamboyance. And the idea came from Rajini himself. He is a devotee of the saint. He took the idea to K Balachander (KB, as he is known) who produced the film. I directed it. His performance, his involvement in the film, was unforgettable. During the 90-day schedule, the entire unit was on a kind of vrat, abstaining from cigarettes and non-vegetarian food. We took the script first to Mantralayam, the abode of the saint, and got it blessed. We did the same thing again with the first copy. Among the commercial films we did Nettri Kann was a big hit. It had Rajini playing the roles of father and son. Usually in such films, the father turns out to be the good guy and the son is a bit of a wastrel. Here it is the father who is lecherous. The son is the good guy. Balachander said that the film had a lot of scope for Rajini, that we should extract his best. Thankfully, we did. If Rajini is a diamond, then KB and I worked together to perfect him. KB discovered him. I helped to polish him. Rajini is the kind of person who is involved in every aspect of the film he is working on, right from the scripting stage. Even when doing an out-and-out commercial film, he has to sit with his script, get a feel of the character he is playing... You can't separate the actor from the star, because he is very involved with whatever role he plays. He is very demanding of himself, has to be one hundred per cent satisfied with every take he gives. He drives himself very hard. I mentioned his commercial hits such as Murattu Kaalai and Paayum Puli. Then of course there is Aarulirunthu Arupathuvarai, Bhuvana Oru Kelvikuri and Engeyo Ketta Kural for sensitive performances. He has a flair for comedy too. We did Velaikaran and Guru Sishyan. In the former, he plays a simpleton whose attempts to talk English brought the house down. In the latter, he and Prabhu were brilliant at comedy -- by the way was this was Gauthami's debut film. Rajni is very popular with kids. You will see many of them imitating that famous flick of the hair or some other mannerism. It is a reflection of what a good role model he is that parents actually encourage their kids in this. Now, how do I describe the Rajinikanth I know? I would say he is, at the bottom of it all, human. That is the best adjective I have. It is this quality of humanness that stands out. He acts in front of the camera... never behind it. In the sense, he is a natural, unaffected person in real life. He is open, frank, very forthright, very loyal to his friends and family. A great human being. Twenty-five years in the industry for him, 25 films with him for me... It gives me great pleasure to realise that I too have had some small role to play in his success.